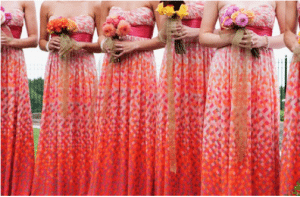 The most traditional style of bridesmaids dresses is the uniform block colour look. 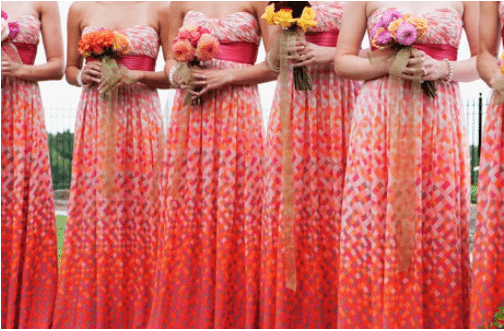 It can be difficult to get a dress that suits many types of women but if your bridesmaids are of similar shape and height this can be a good option. On trend at the moment, the mismatched look can be another really easy or hard one to pull off. 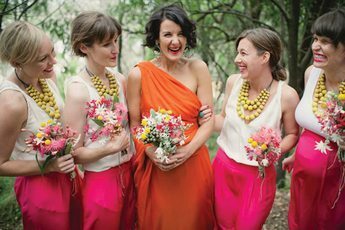 The pictures above are a great example of how to pull off this look, the left, similar styles all in the same shade, the one to the right all in brights, similar style dresses in the same fabric and hair pieces to tie in all the colours. Becoming more popular is the pattern or prints look. This can make shopping both harder and easier, most bridesmaids dresses come in block colour however when looking at patterns and prints you have many more options at casual dress shops. Maybe the next big trend? I love the pop of colour in the photo to the right and the white breaks it up perfectly- a great way to incorporate bright colours that aren't too full on.